États-Unis du Brésil: Compagnie du Chemin de Fer de São Paulo et Rio Grande. This is a c. 1900 broadside promoting investment in Brazil's São Paulo-Rio Grande Railway. Written in French and published by the Imprimerie Chaix in Paris, a map of the Brazilian coastline from Rio de Janeiro, Brazil to Montevideo, Uruguay occupies the left portion of the broadside. Cities, towns, and villages are identified, but the focus of the work is the planned construction of the Compagnie du Chemin de Fer de São Paulo et Rio Grande (Sao Paulo-Rio Grande Railway Company) between Itarare to the Uruguay River with two spur lines to the Parana River. Illustrated in orange, lines operated by the Compagnie du Chemin de Fer de São Paulo et Rio Grande would connect with lines operated by the Compagnie Générale du Chemins de Fer Brésiliens (General Brazilian Railway Company) and the Compagnie des Chemins de Fer Sud-Ouest Brésiliens (Southwest Brazilian Railway Company). The routes of the Compagnie Générale du Chemins de Fer Brésiliens are shown here in black, while the lines operated by the Compagnie des Chemins de Fer Sud-Ouest Brésiliens are blue. The text on the right highlights the guarantees the Compagnie du Chemin de Fer de São Paulo et Rio Grande has received from the Brazilian government, particularly in reference to the government's financial support, which was to be paid in gold. Below these six decrees, a detailed description of the railroad's route is provided, while at the same time promoting the route's utility and importance. Although no outright request for investors is written here, the broadside is heavily promoting the probable financial successes of the areas the newly-constructed railroad would travel through, particularly with regard to agricultural and other natural resource exports. The company insinuates that, even though the route is connecting cities and rivers, that their major source of income will be from transporting raw materials. 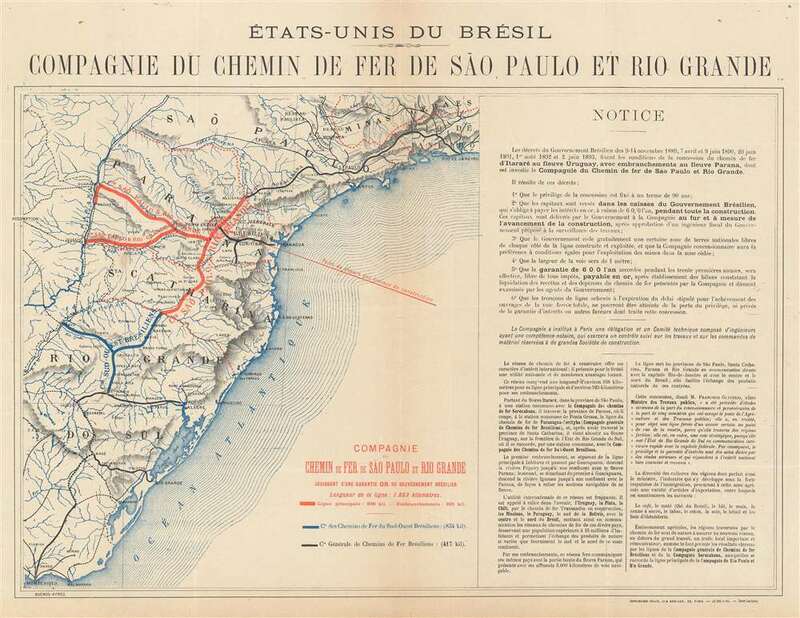 This is important since one of the proclamations from the Brazilian government was that the company would receive land grants on either side of their new route, and the production of this broadside suggests that the Compagnie du Chemin de Fer de São Paulo et Rio Grande was in search of French buyers for this land. This broadside was created c. 1900 most likely by the Compagnie du Chemin de Fer de São Paulo et Rio Grande and printed by the Imprimerie Chaix in Paris. This is an extremely rare find, as it is not in any institutional collections. Furthermore, nothing even remotely comparable has come to light either. Imprimerie Chaix (1845 - 1965) was a French publishing firm based at 20 Rue Bergère in Paris. They are best known for printing and publishing Belle Époque posters, including the celebrated Les Maîtres de l'Affiche. Les Maîtres de l'Affiche was a highly influential art publication featuring the Belle Époque commercial posters. Based upon a monthly subscription system, members received four prints each month over a five year period, resulting in 240 images along with 16 bonus images. Very good. Light toning along original centerfold. Closed margin tears professionally repaired on verso. Blank on verso.